It’s once again time for my annual blog post that stresses the importance of new construction inspections. 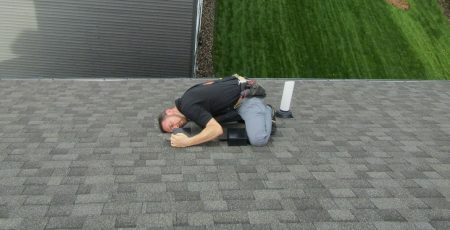 Specifically, home inspections. I still talk to home buyers, home owners, and real estate agents who have never even considered the idea of getting a home inspection on a brand new home. I won’t bore you with all of the reasons that things go wrong in the construction process because I think these photos do a much better job of getting my point across. 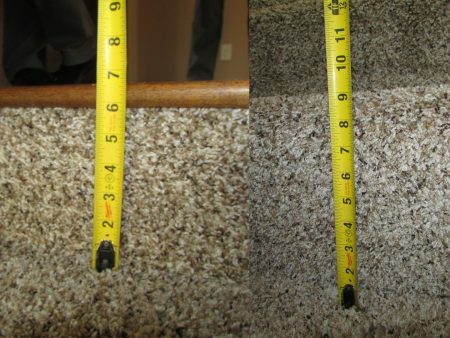 The photos below are all photos we’ve taken during the past year while conducting new-construction inspections, or one-year warranty inspections. 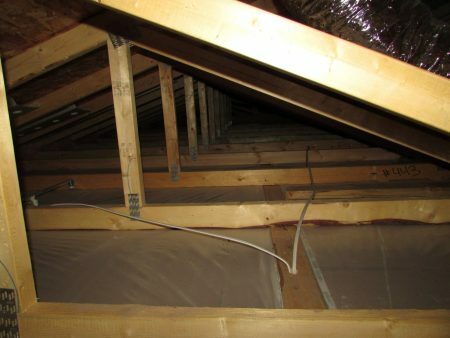 The #1 problem that we find in new construction attics is insufficient insulation. As stingy as some insulation contractors seem to be with their insulation, you’d think the stuff was worth its weight in gold. 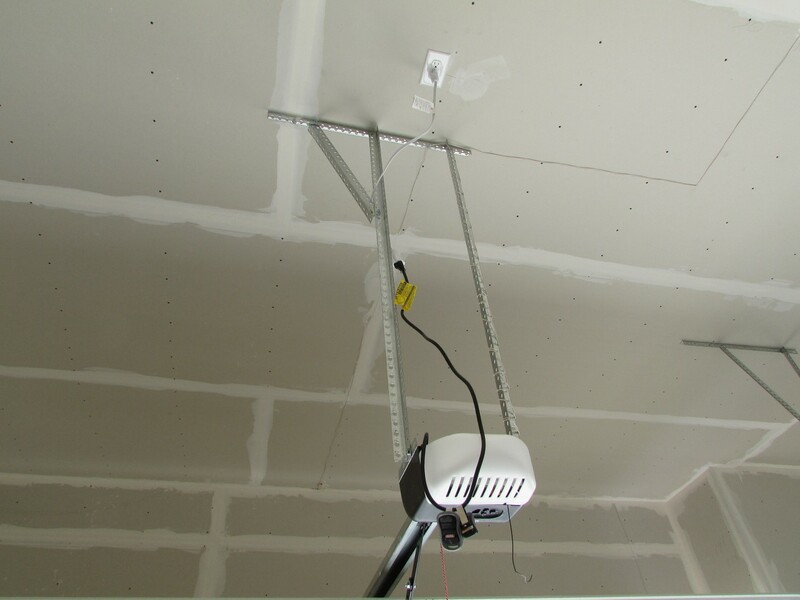 Approximately half of the new construction homes that we inspect have insufficient insulation in the attic. 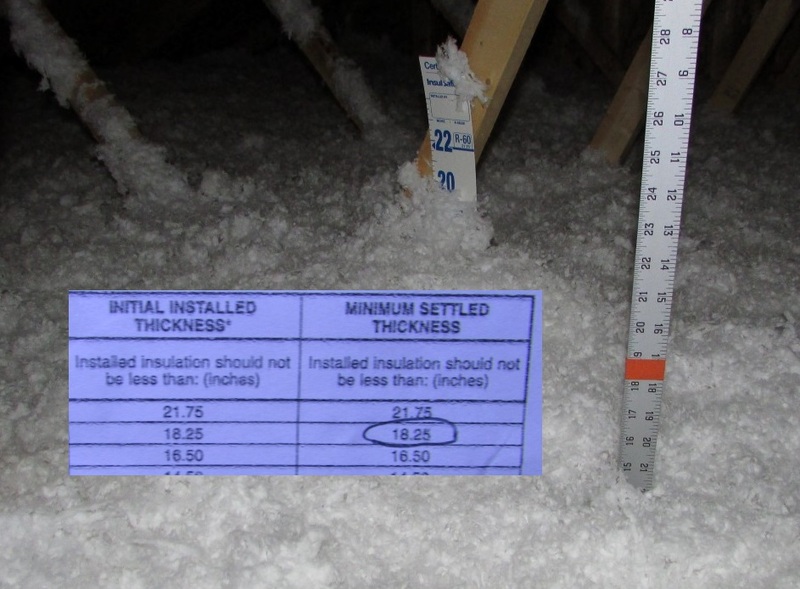 The photo shown below shows the tag in the attic which states the minimum required insulation depth is 18.25″, along with the insulation contractor’s depth marker with insulation mounded high enough to make it appear correct. 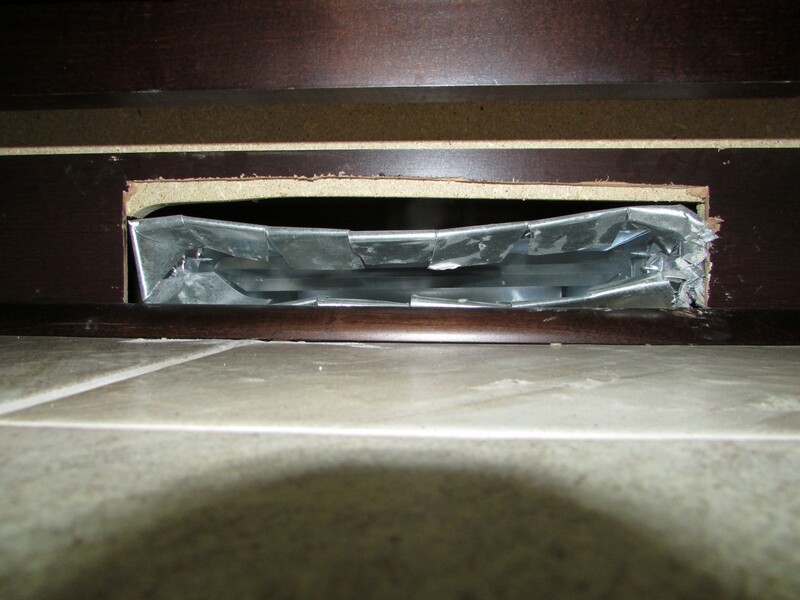 You can also see my aluminum ruler about two feet away, showing the actual insulation depth drops off significantly. The whole attic looked like this. This isn’t right, but it is pretty standard for a new home. 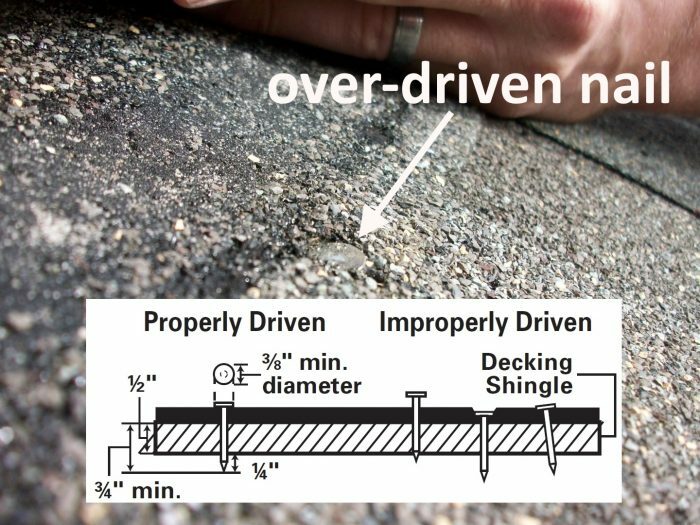 The two images below show the ceiling on a very large, expensive home where the insulation on the first-floor attic was completely missed. The infrared image with the blue colors shows where the uninsulated attic begins. The listing agent was there when I discovered this and was quite insistent that my equipment was broken. I could hardly blame him, as the home had gone through some extra energy audits to get a good HERS rating, and supposedly passed with flying colors. 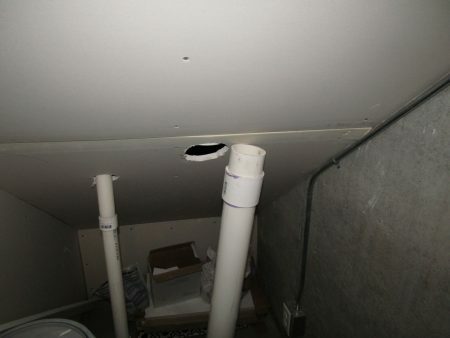 The photo below shows the attic. The shingles shown below were badly buckled, and they’re not going to sit flat over time. 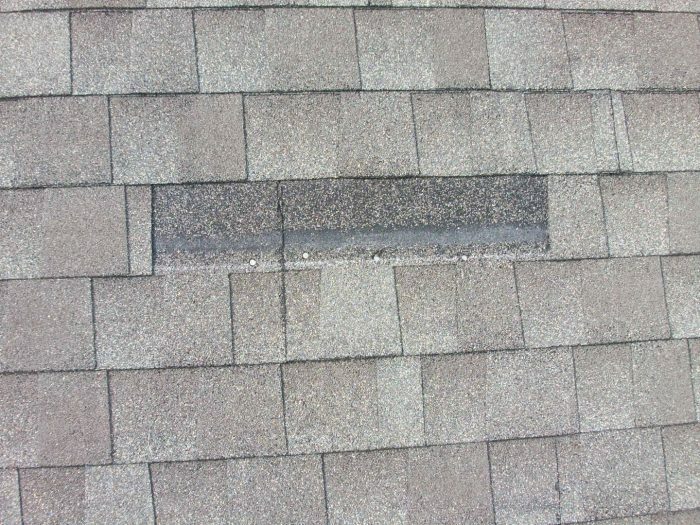 This was mostly likely caused by roofers moving too quickly and not following chalk lines to keep their lines straight. As the lines started going askew, the roofers pulled the shingles down to correct the lines, which caused the shingles to buckle. 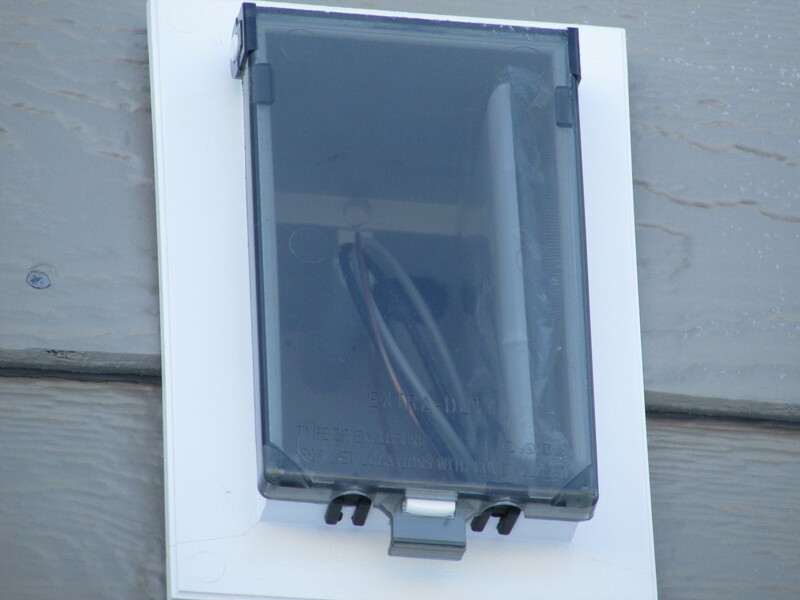 The kickout flashing shown below was nearly useless. Kickout flashing should never be cut; the only reason for doing this is ignorance. 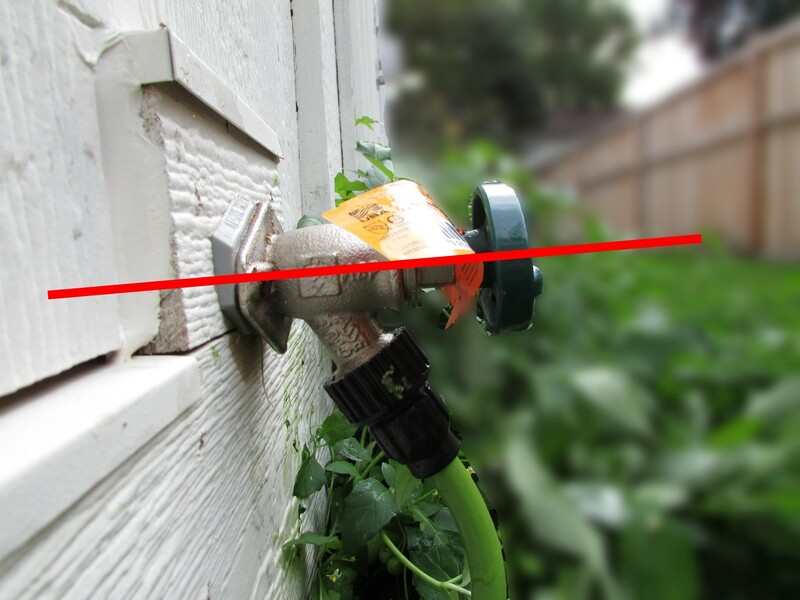 This can lead to a leak at the wall in this very critical location. 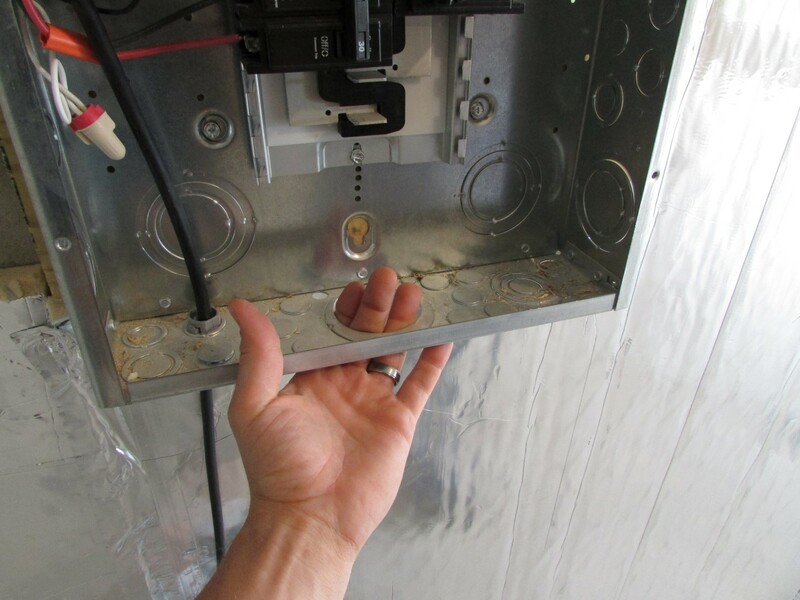 Check out my blog post on kickout flashing for more details on this topic, along with a video showing how easy it is to create a piece of kickout flashing that won’t leak. 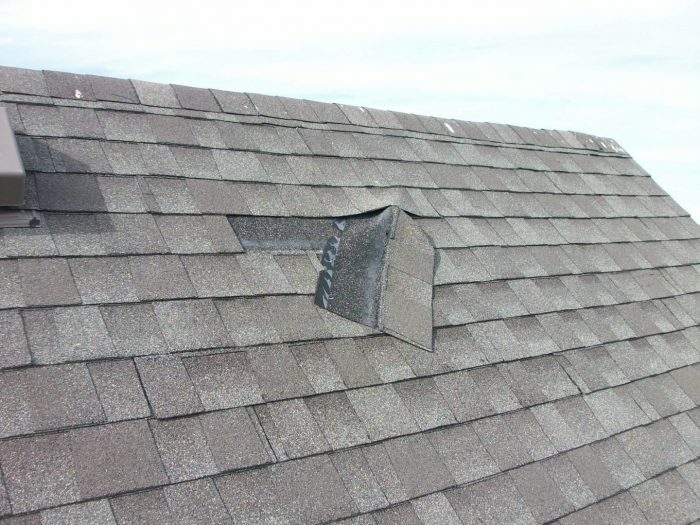 The loose and missing shingles that are shown below were the result of improper fastening; specifically, the issue was overdriven nails. 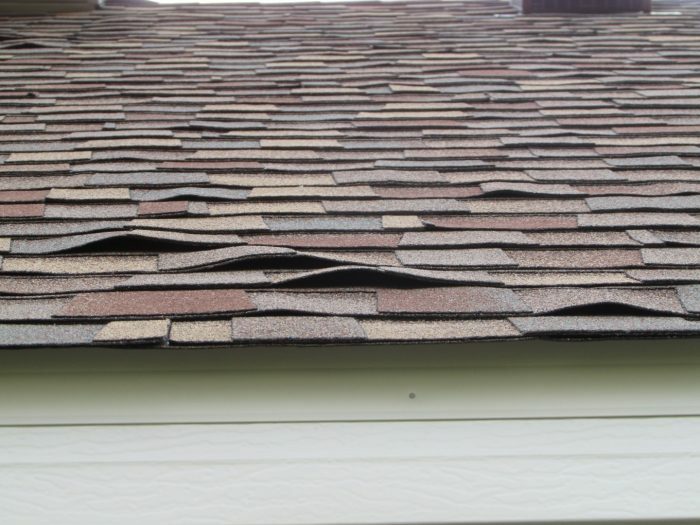 This was a pervasive condition that led me to recommend complete replacement of the roof covering, or obtaining a letter from the shingle manufacturer stating that this improper fastening would not void their warranty. Outlet boxes need to be mounted flush with the surface of the wall. 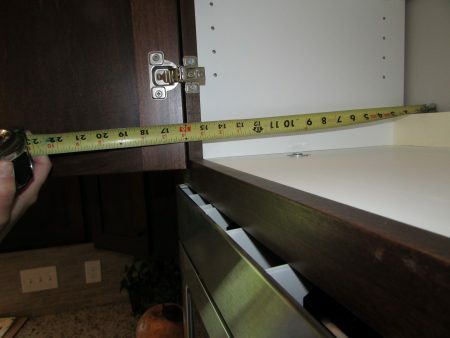 When something like a cabinet makes this tough to do, a goof ring or box extender should be used. 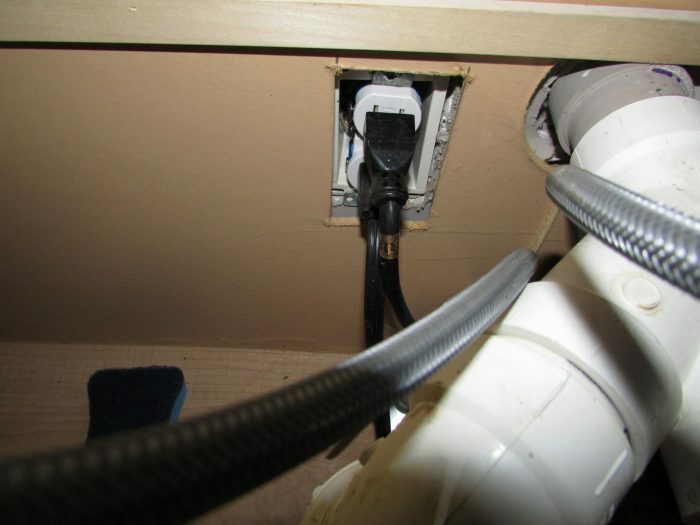 That wasn’t done at this outlet below the kitchen sink, making it impossible to properly install a cover plate. CSST gas piping needs to be bonded, period. It doesn’t matter if it’s the black ‘arc-resistant’ stuff or not. When CSST is bonded, it needs to be bonded to the electrical service grounding electrode system, not at the bonding terminal for the low-voltage communications equipment. 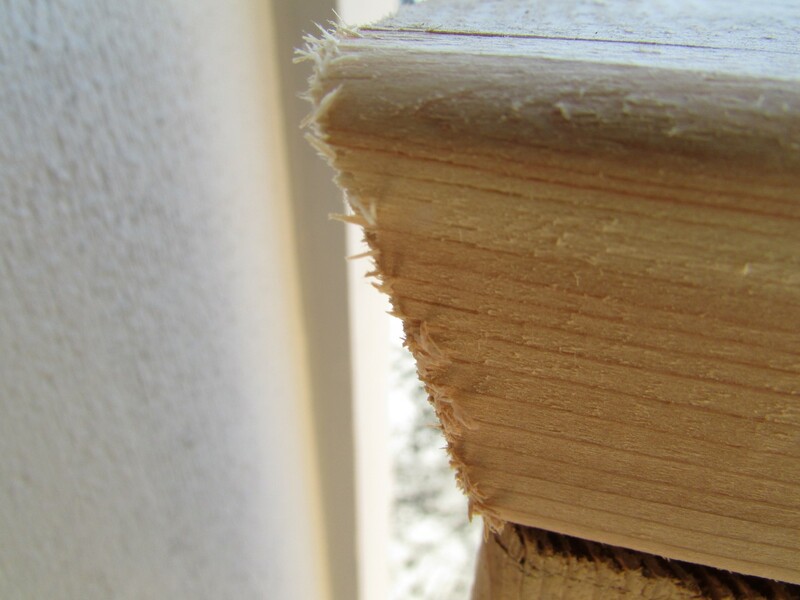 This was actually the builder’s improper fix after not bonding the CSST at all the first time. Everyone knows that garage door openers aren’t supposed to be plugged into extension cords, right? 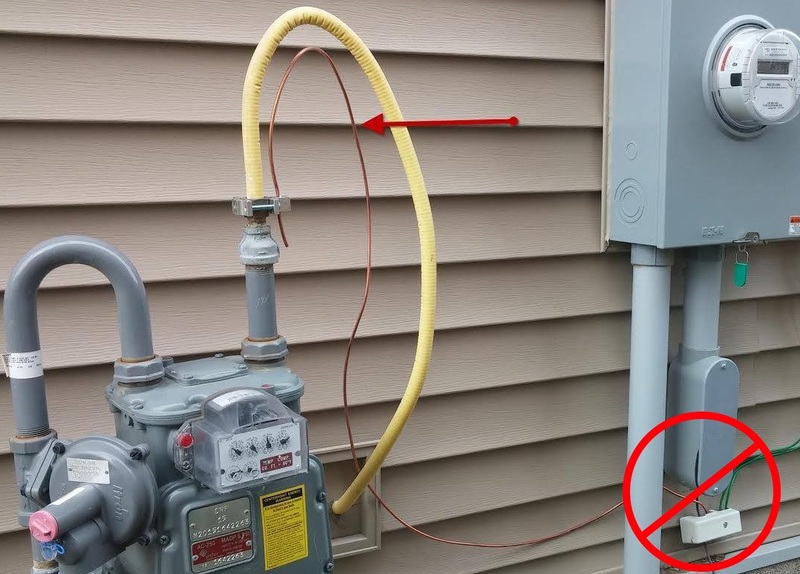 So how does this happen on a brand new home? Don’t ask me. It just does. Unused knockout holes need to be filled. Believe it or not, this is fairly common on new installs. 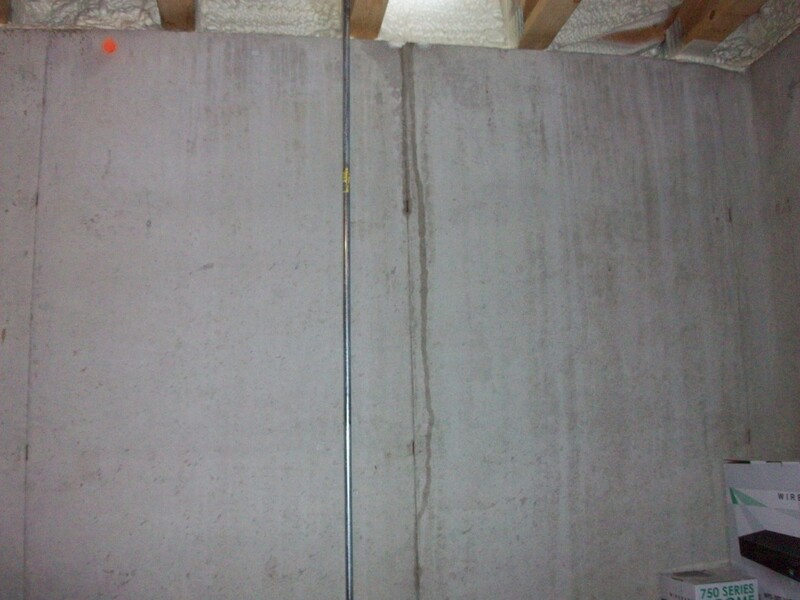 The photo below shows a missing outlet at what will eventually be a second-story deck. 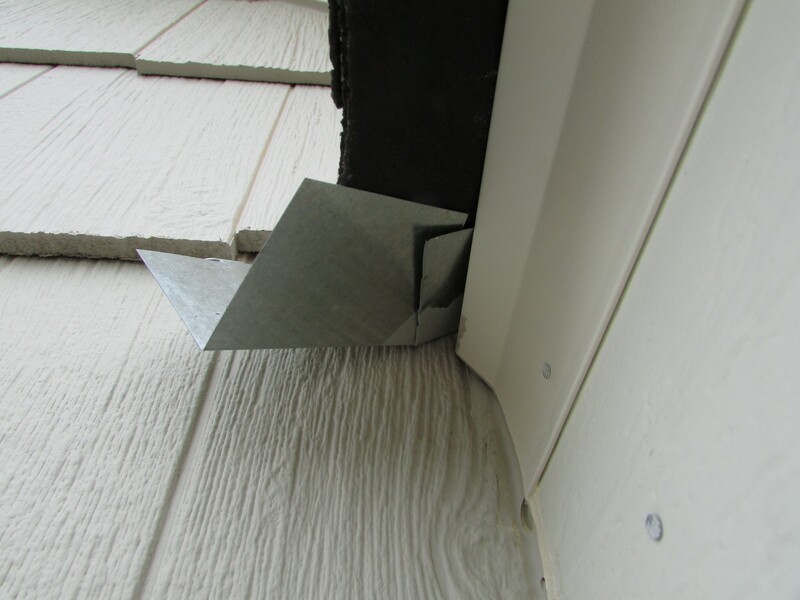 One of the most common siding materials being used today is composite siding, which is a term that I use to describe both James Hardie siding and LP Smartside siding. Both of these products get installed improperly at nearly every new home that is built. 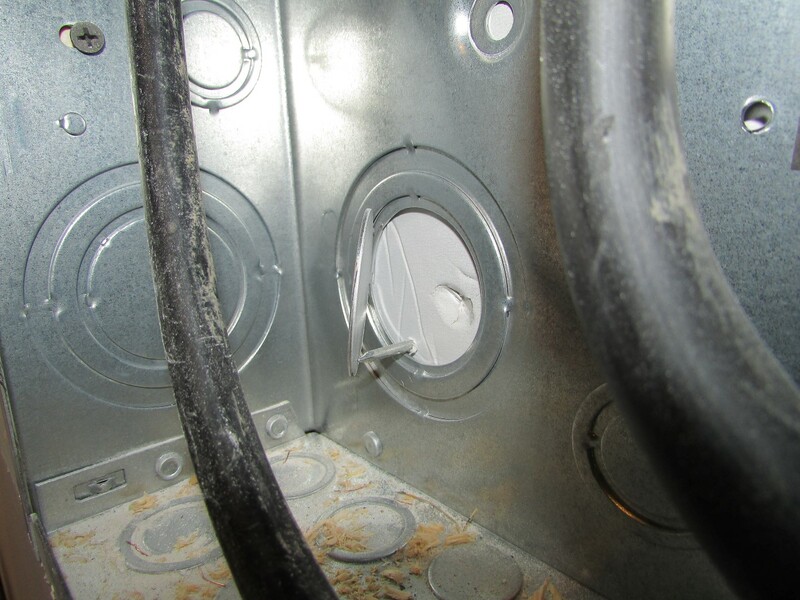 Check out my blog post from last year on LP Smartside installation defects. I won’t repeat all of that information here, but I can tell you that it’s quite rare to find a new home without any siding installation defects. The photo below shows a goofy installation of the gas fireplace vent at a home with vinyl siding; the terminal should have been surrounded by J-channel, not simply caulked. Any professional home inspector, builder, siding installer, etc is surely putting their palm to their forehead while looking at this. Again, this is new construction. This next photo shows a close-up view of Splinter City, found at a front porch guardrail. For the record, there’s nothing in the building code that prohibits this kind of thing, so this is technically a legal installation. It’s just sloppy. Would it surprise you to learn that Minnesota has no requirement for garage floors to be sloped so water (aka “snow melt”) goes to a drain or the door opening? Crazy, right? The garage floor in the photo below actually doesn’t violate anything in the building code, but it sure is a nuisance, and it’s something that we reported as a problem. The International Residential Code, which we’ve adopted as our residential code here in MN, has language that says “The area of floor used for parking of automobiles or other vehicles shall be sloped to facilitate the movement of liquids to a drain or toward the main vehicle entry doorway”. The crazy part is that through code amendment at the local level, we’ve stricken that paragraph from our local code. I’ve asked about this, and the answer I’ve been given is that this is supposed to be common sense. Obviously it isn’t, and obviously I’m not getting the whole story. Check out my super high-tech method of determining airflow; it’s a piece of toilet paper. 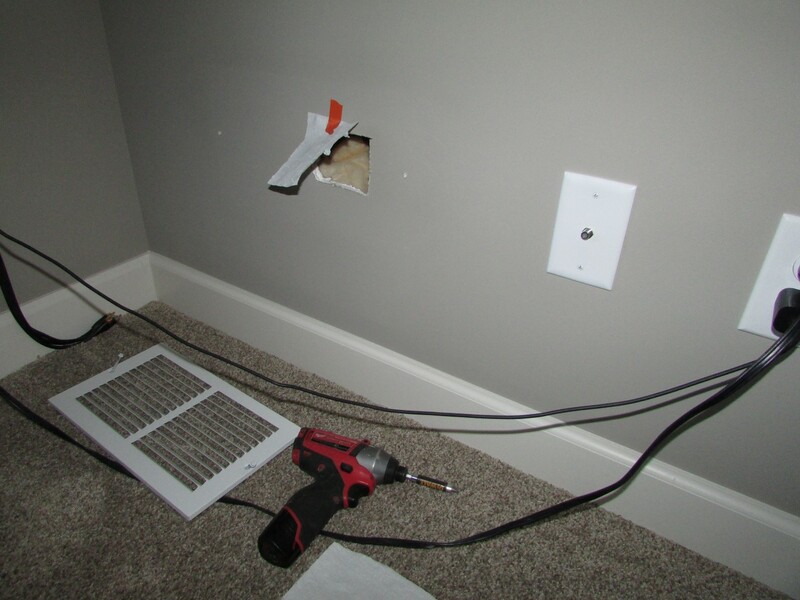 There’s a lot of air coming out of this hole in the wall, which is simply an access panel for the bathtub drain. 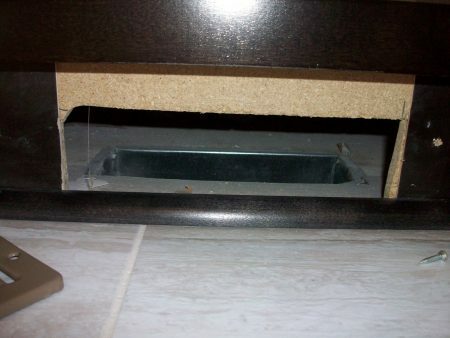 Why is air coming out of this hole? Getting to the bottom of that goes beyond the scope of a home inspection, but my assumption was leaky ductwork. Here’s a disconnected dryer duct. I know that I’ve mentioned poorly installed ductwork at toekick registers before, but the stuff that I continue to see continues to amaze me. These are all new photos. 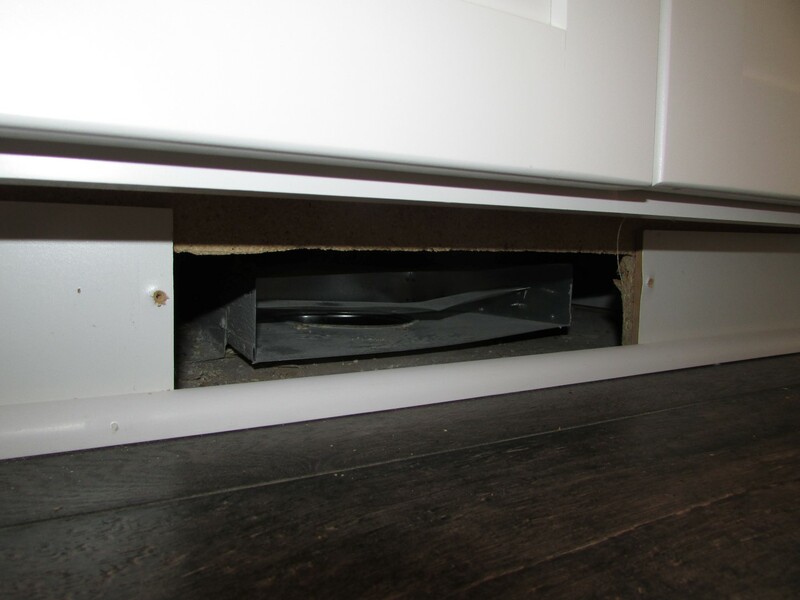 Direct vent / sealed combustion furnaces obtain all of their combustion air directly from the outdoors; when the cabinet for the burner area isn’t sealed, it’ll pull a lot of its combustion air from inside the house. This is a simple fix, but why didn’t someone else catch this? Do you see what’s wrong in the photo below? 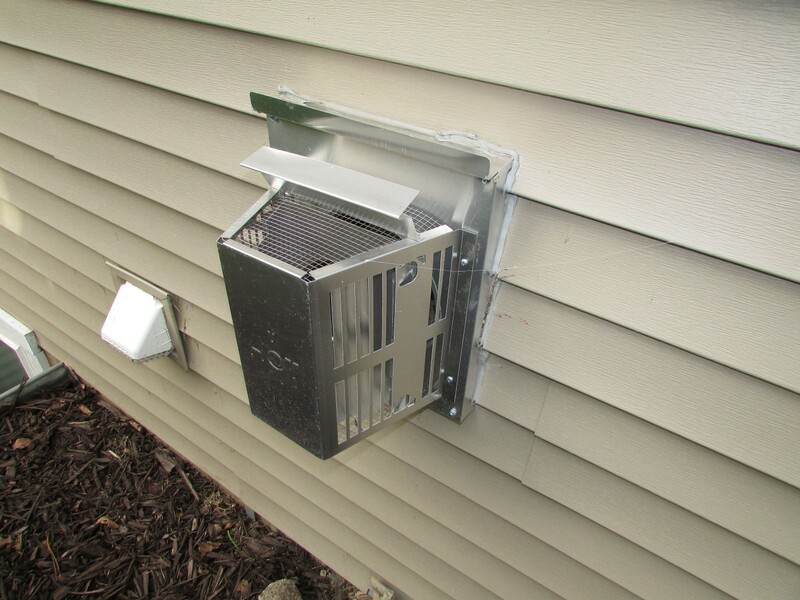 What you’re seeing is an air intake for an air exchanger blowing air out. The leaves we’re holding are bending backward from the airflow. The exhaust for the air exchanger, not pictured, was also blowing air out. 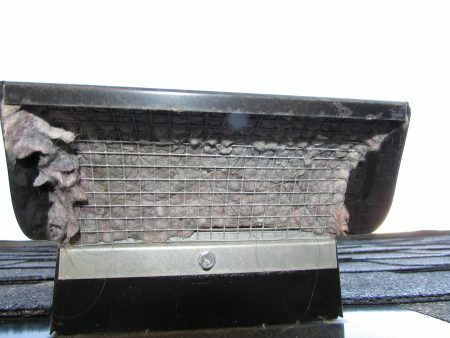 This was happening because of a botched installation; the intake duct was connected to the stale air exhaust on the HRV. No kidding. 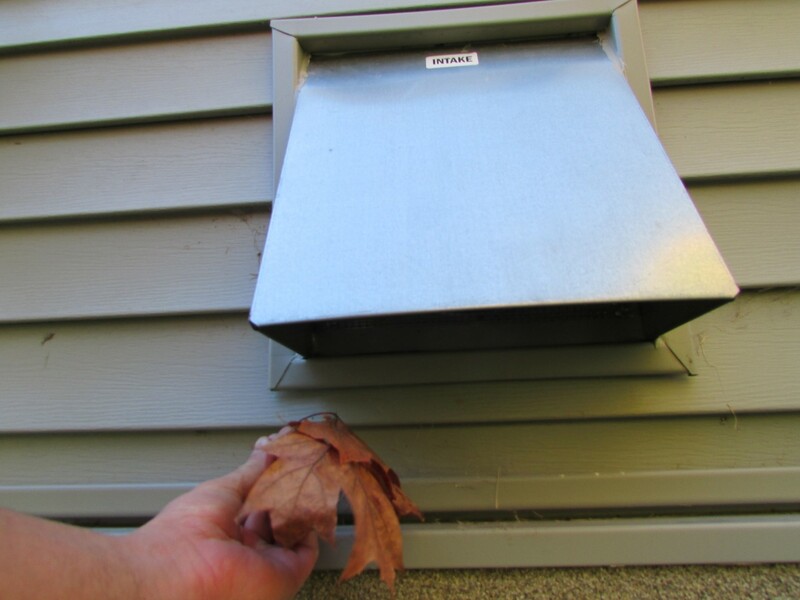 I discovered this while performing a one-year warranty inspection at this new home, wherein the owner had been complaining about frost on the windows, leaky windows, and indoor comfort issues for the entire first year that he owned his home. The builder was unable to resolve any of these issues. 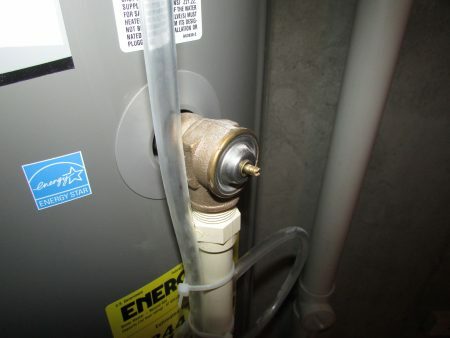 Having an air exchanger installed in this manner could certainly cause all of those problems. 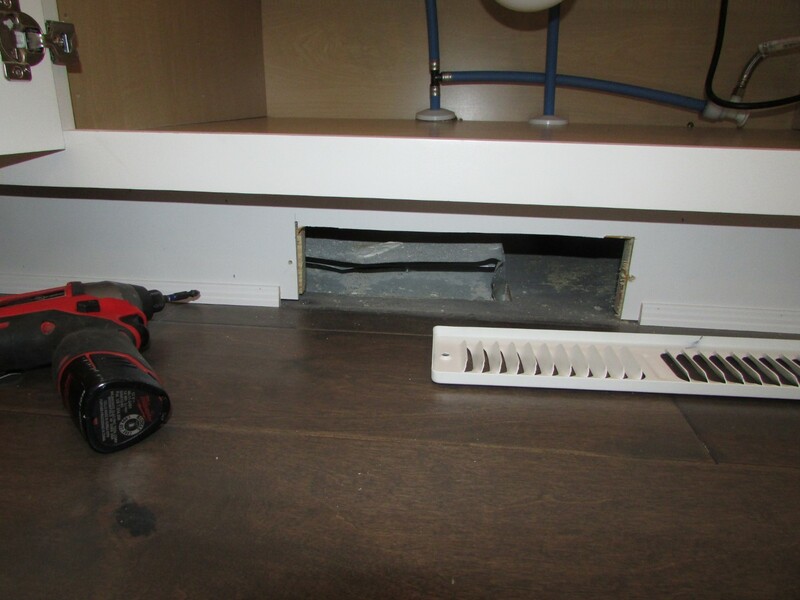 The fix was to have the duct re-arranged at the HRV. 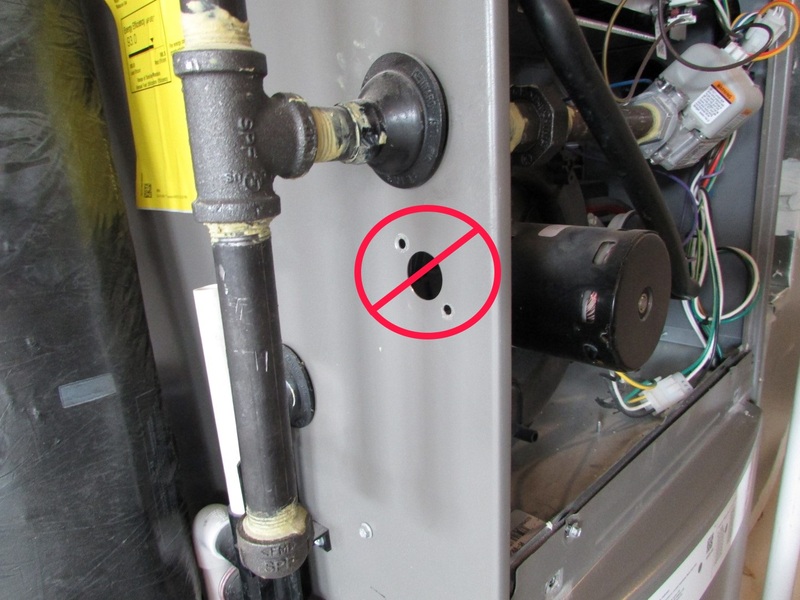 Clothes dryers shouldn’t exhaust through the roof, but there is nothing in the code that prohibits this, so it happens. What’s really bad is when a clothes dryer exhausts through the roof and someone forgets to remove the screen at the terminal. This will lead to a clogged terminal in a fairly short amount of time. At this particular home, the homeowner had complained to the builder about his clothes dryer not working properly, and a few different people had come out and determined that there was nothing wrong, including a rep from the clothes dryer manufacturer. All it took was an inspection on the roof to figure out the problem. These two units are way too close to each other. 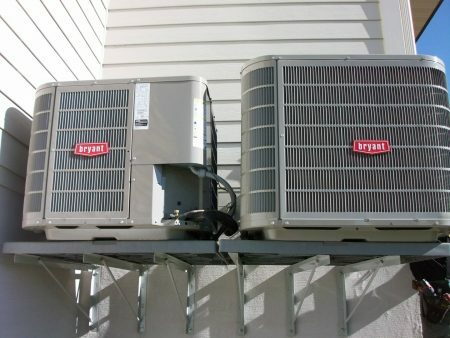 This particular manufacturer requires the units to be spaced at least 24” away from each other in order to properly dissipate heat. 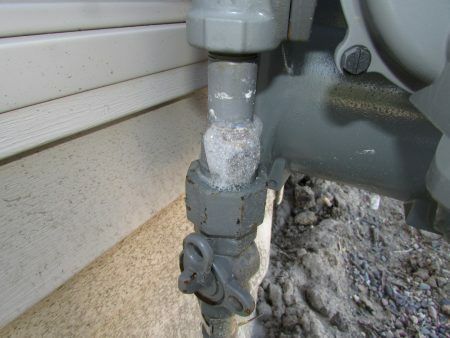 Take a look at the photo below and see if you can guess what the problem was. 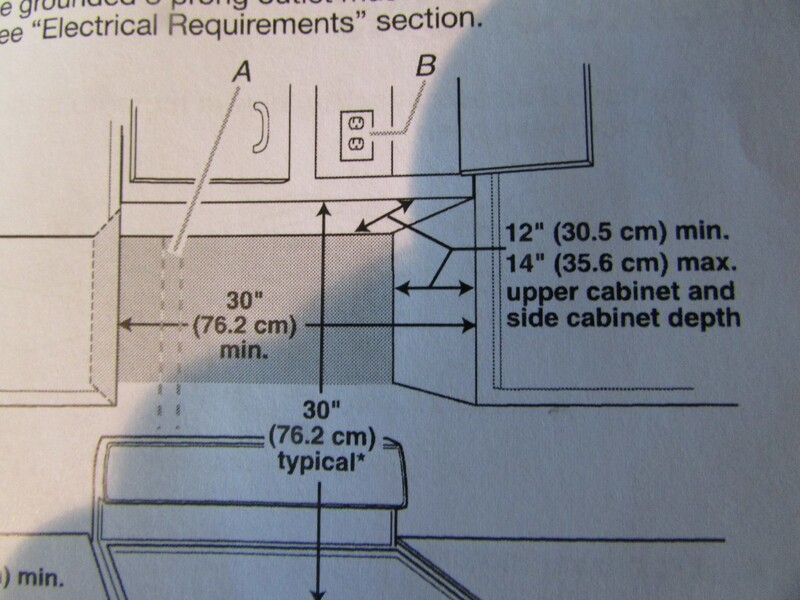 I think most plumbers and home inspectors will get this one right away. 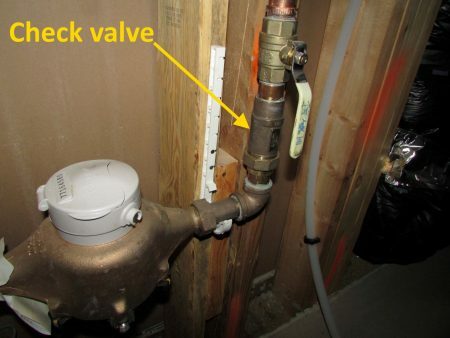 When there’s a check valve installed on the water supply for the home, there must also be an expansion tank installed to give the potable water somewhere to go when the water heater does its thing, thereby making the water expand. If no expansion tank is installed, the water will have nowhere to go when it gets heated, so the temperature and pressure relief valve on the water heater simply does its thing, and it relieves the pressure. 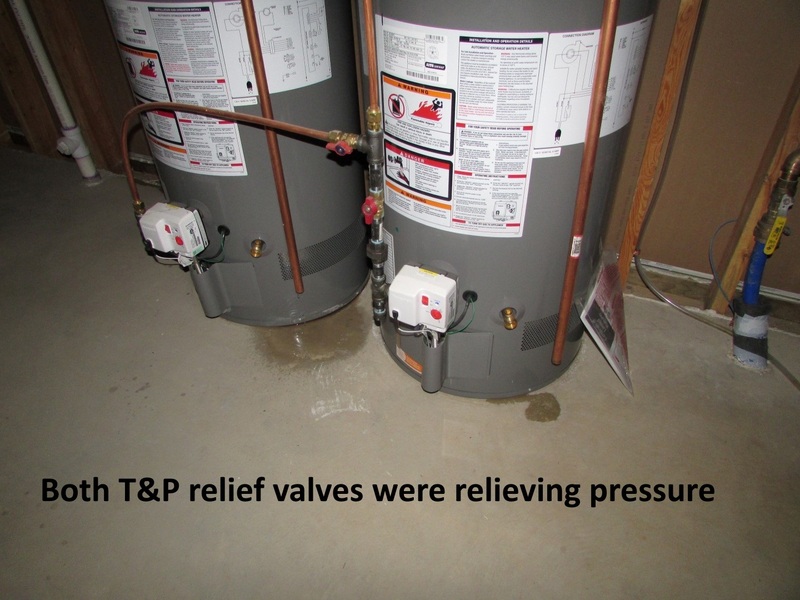 While we’re on the topic of temperature and pressure relief valves, this one had a broken / missing test handle. 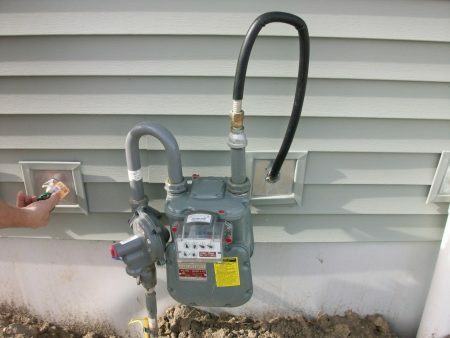 Here’s a gas leak at the meter, outside of the house. Here’s a gas leak inside the house. 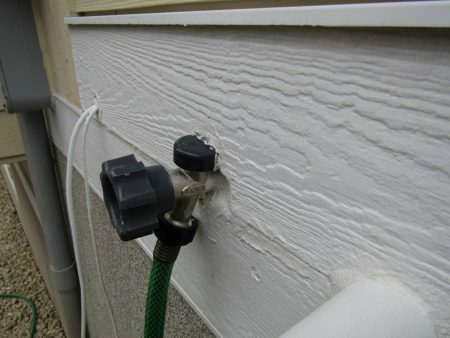 Frost-free faucets need to be installed so water drains out. When this doesn’t happen, they can freeze and burst. This one was backpitched. 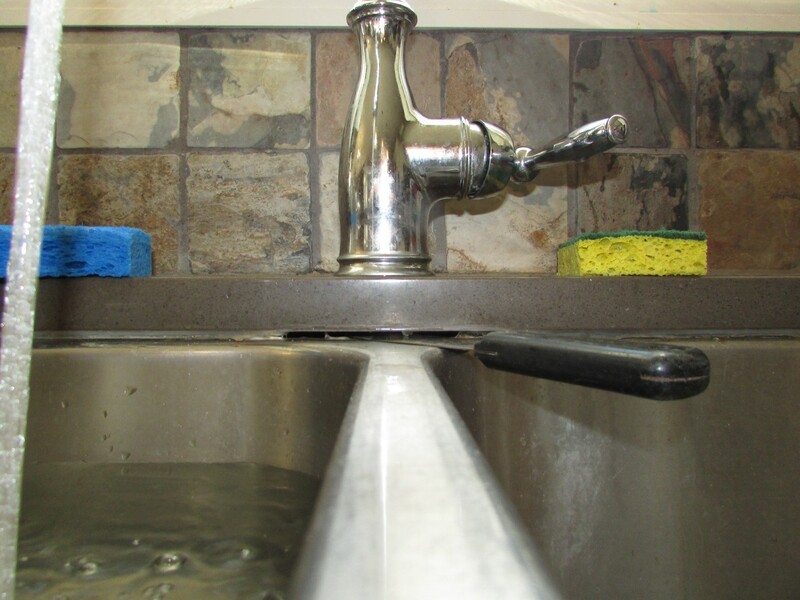 The good thing about the faucet shown above is that the faucet was mounted to the exterior wall finish; not buried in it like the faucet shown below. This next one was a huge mess that we discovered during a one-year warranty inspection. The tiled shower in the master bathroom wasn’t properly installed, and it leaked just a little bit every time the owner took a shower. 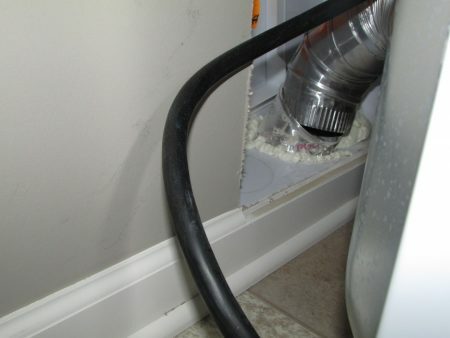 It wasn’t leaking enough for the owner to know about, but it was enough to cause major damage to the subfloor in about half of the bathroom. 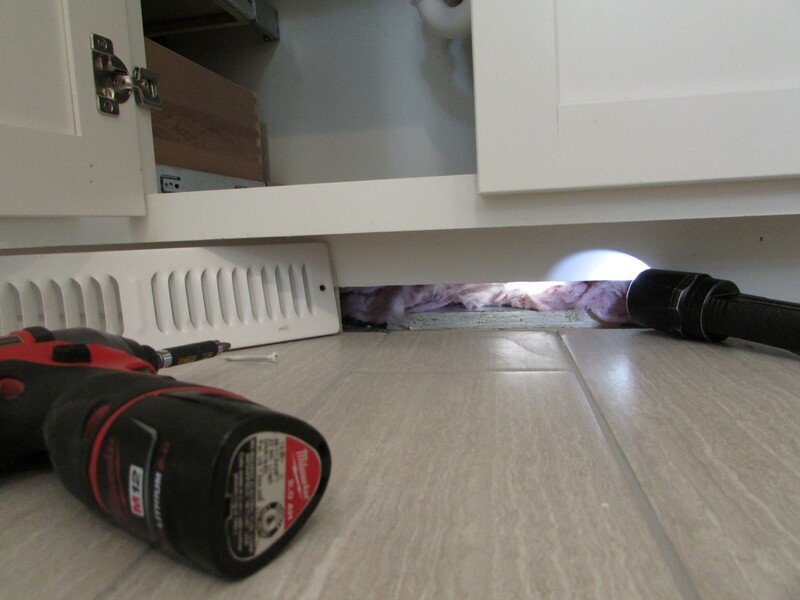 This fix required a complete tear-out of the tiled shower, as well as all of the tile in the floor surrounding the shower. 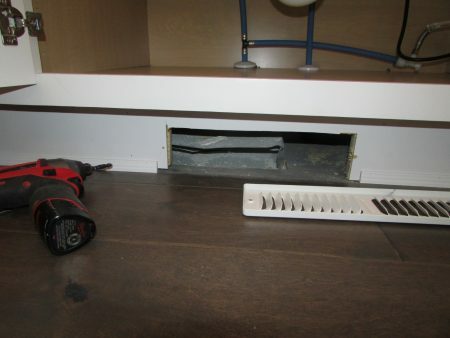 The photo below shows the wet subfloor adjacent to the shower, which could be seen by removing the bathtub access panel. 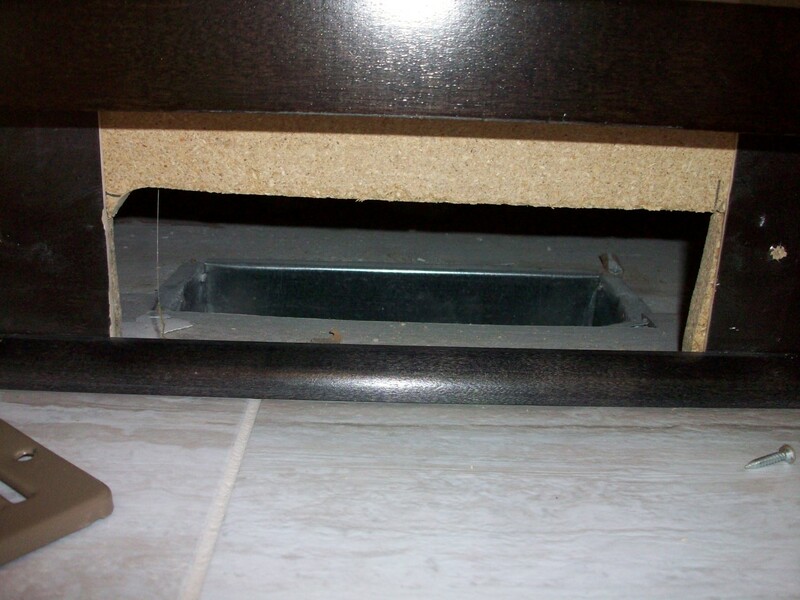 To discover leaking shower pans, we flood test tiled showers during our home inspections. The photo below shows water leaking down into the basement from another leaking tiled shower, again identified during a one-year warranty inspection. 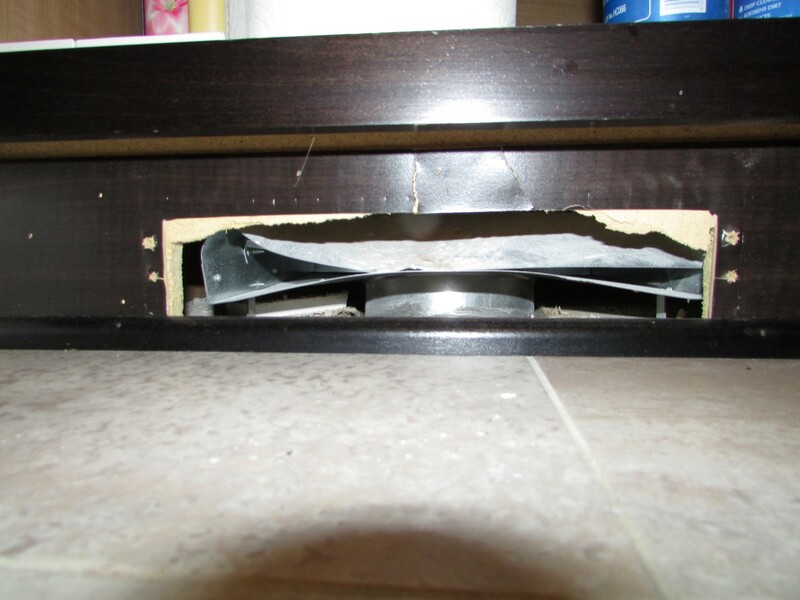 The bottom of this sink base cabinet was wet and water damaged. Water was leaking in at the intersection between the sink and countertop because it wasn’t fully caulked. 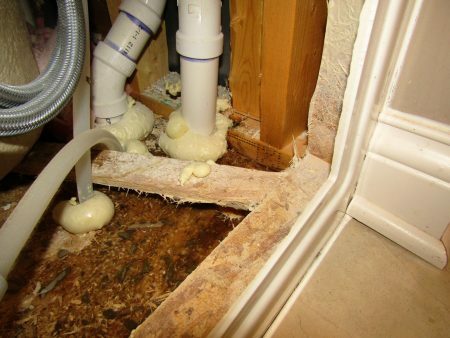 It’s quite rare to find mold on new construction inspections, but it sometimes happens. I had no idea where this stuff came from; my recommendation was simply to clean it up and make sure it didn’t come back. 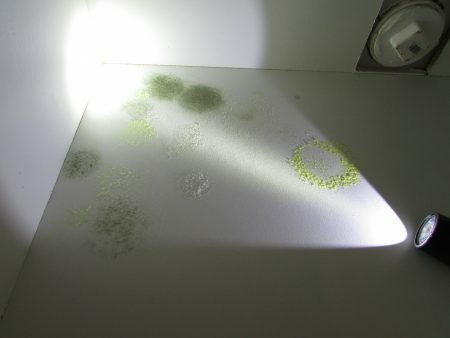 Side note: did I recommend mold testing? Heck no. As far as I’m concerned, there would be absolutely no value in having that done. Here’s an interesting issue that was actually brought up to me by my client during a one-year warranty inspection; the cabinet above this microwave / hood fan was too large. The manufacturer of the microwave/hood fan requires the upper cabinet to protrude from the wall no more than 14”, but this one stuck out 16”. 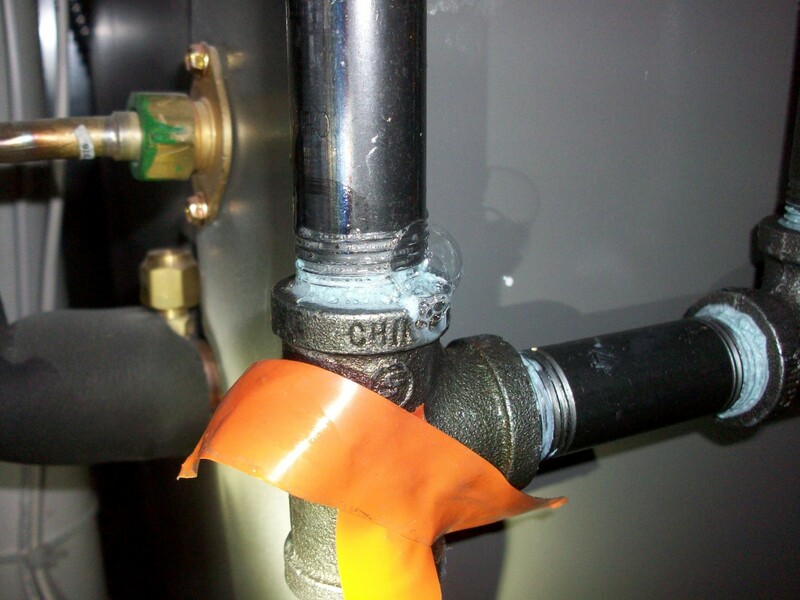 This next photo shows a radon pipe that wasn’t glued together. We found this purely by accident. For my last photo, here’s an improperly constructed stairway. 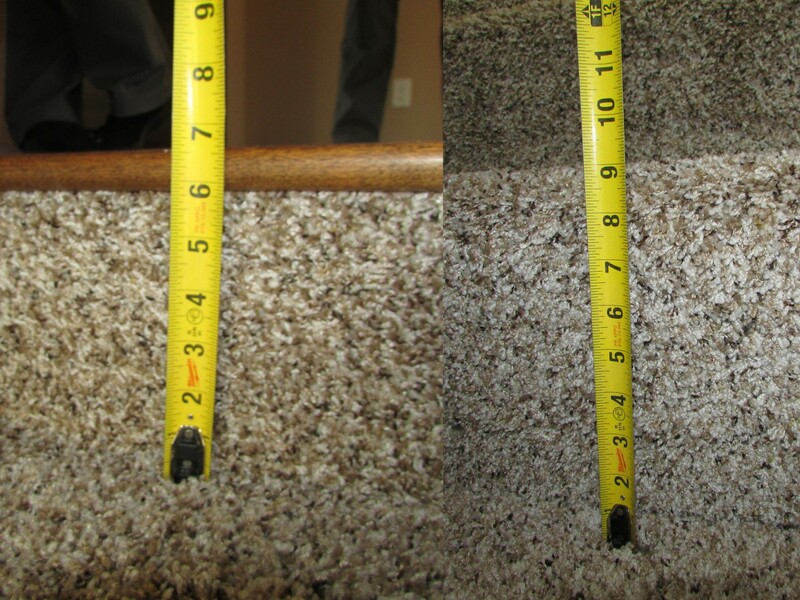 The top riser was only 6” high, while the last one was approximately 9” high. 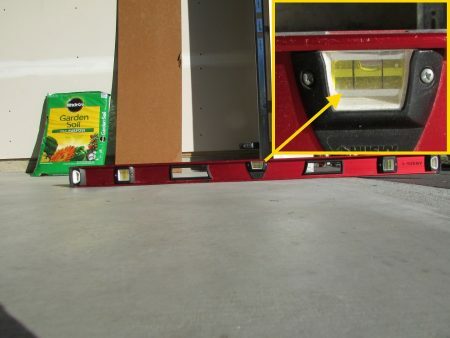 The maximum allowable riser height is 7-3/4”, and the maximum allowable difference in riser heights for a single stairway is 3/8”. This wasn’t discovered until our inspection, which happened right before the closing was supposed to take place. The only acceptable solution was to tear out the stairway and re-build it, which the builder did. 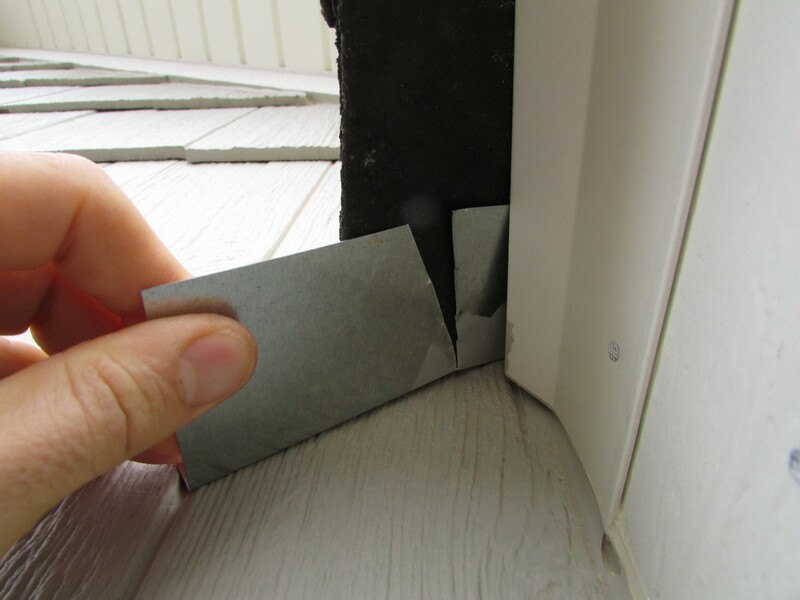 New homes need home inspections too. It doesn’t matter who the builder is, what city it’s in, nor which municipal inspections have already taken place. If you’ve purchased a home in the last year but didn’t have it inspected, consider getting a home inspection before your one-year warranty is up.